I am stepping out of the Land Cruiser to throw some garbage in a trash can and look up to the waterfront. Where is that rumble coming from? 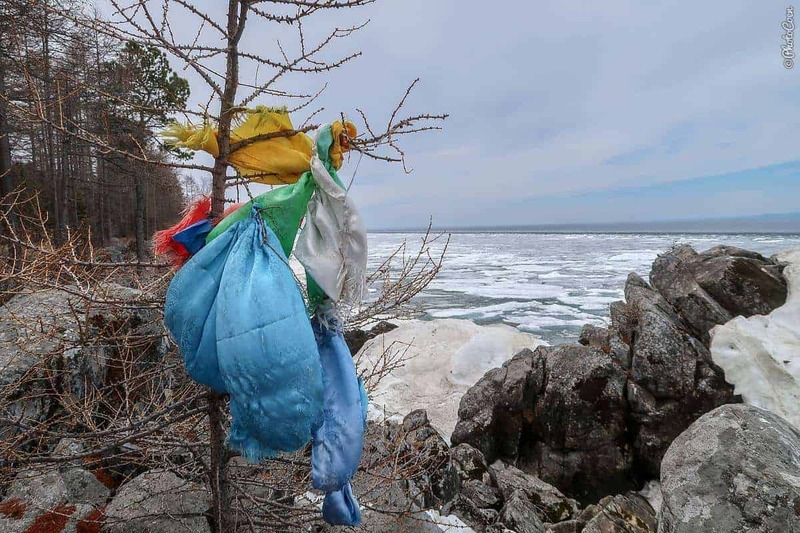 A waterfall on Lake Baikal? The ice is doing the best it can. Mother nature is groaning and squeaking. The last reminders of winter are shaving against one other, pushing and shoving, pulverizing each other into thin needles of transparent ice that are pushed up until they break free and float away in bundles. I feel the force in my bones, in every cell of my body. 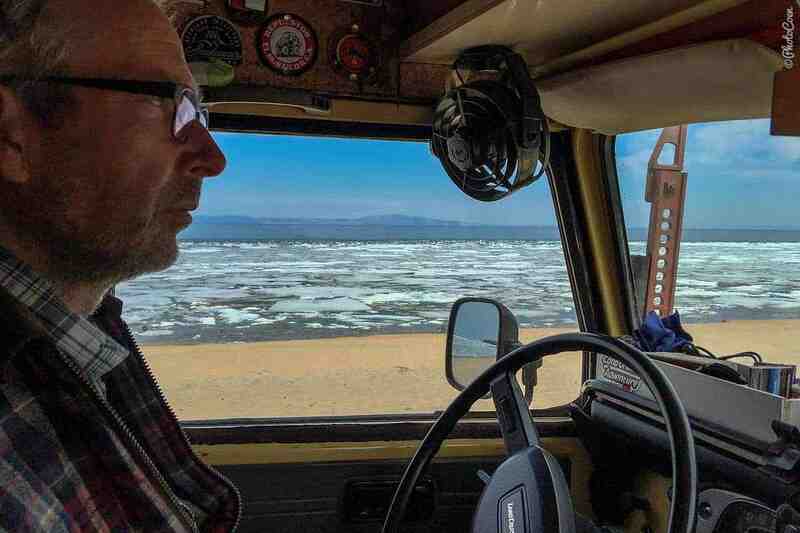 I am in awe of the power of nature and stand transfixed, staring out over all this melting ice, enthralled by the sounds. It’s May 15. Winters are long here. 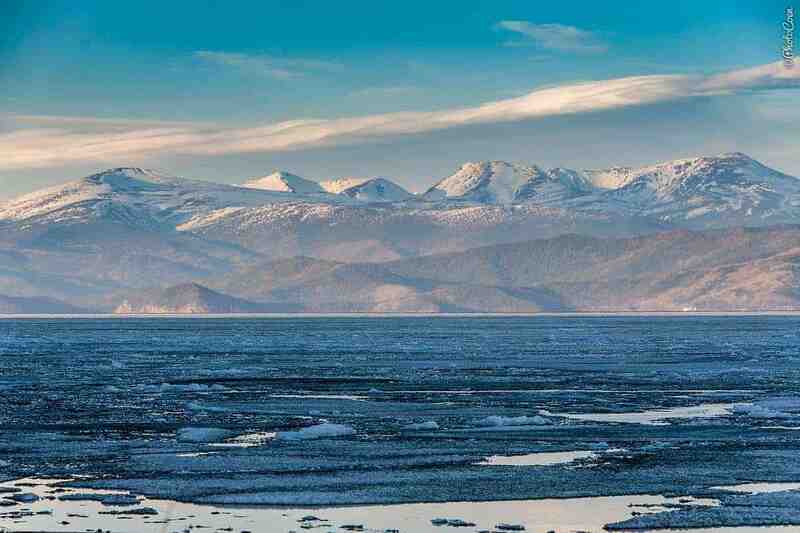 When, at last, I pull myself away, we continue our road, following the east side of Lake Baikal northbound. The smooth asphalt cuts through birch and pine forest. 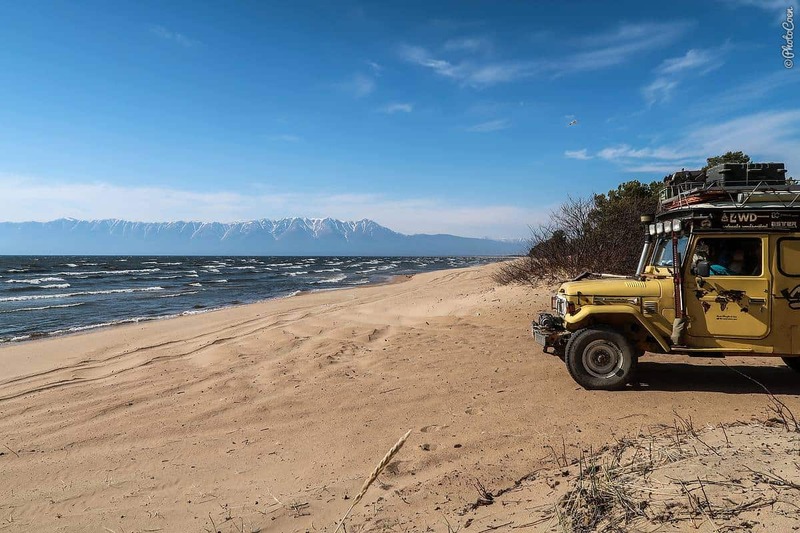 Lake Baikal has sandy shores with tons of places to picknick and rough camp. 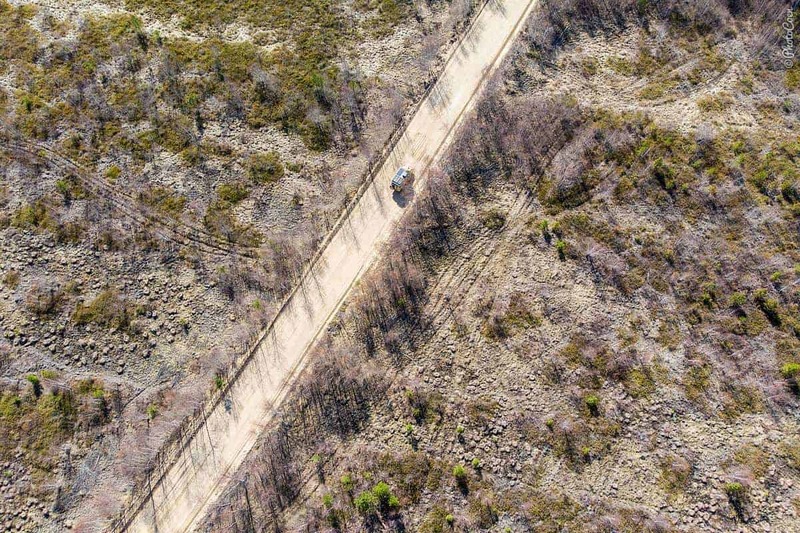 The shore is accessible, however, on the right side of the road all tracks leading into the forest are closed off by red-white beams, probably because due to the high risk of wildfires. 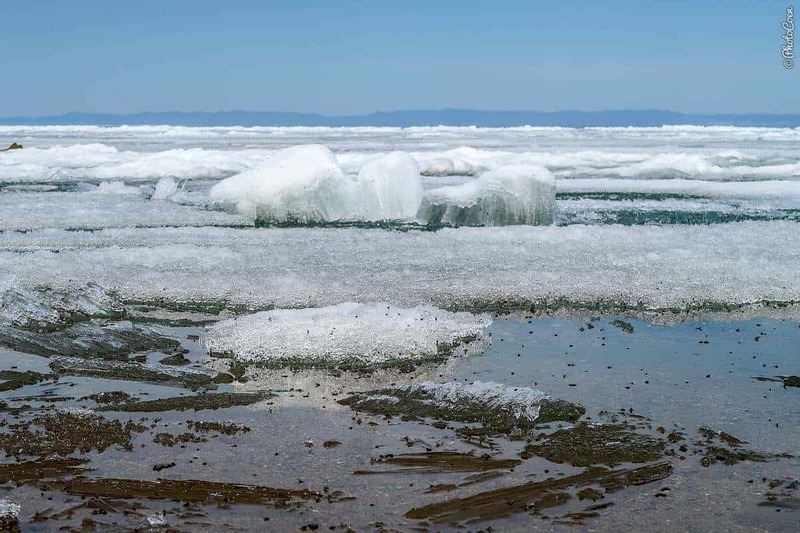 Lake Baikal becomes truly spectacular when a vertical wall emerges from the middle of the cobalt-blue water surface. The high-ridge peaks have patches of snow and slivers of white run down the slopes. 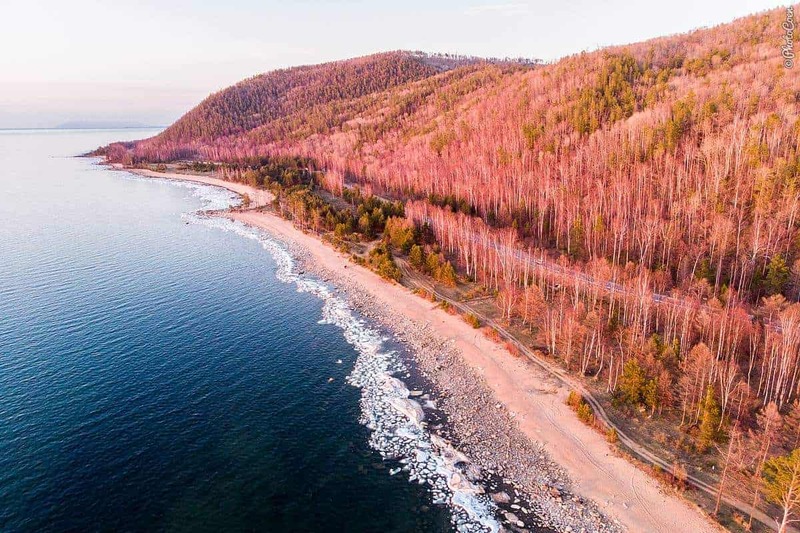 This is the Svyatoy Nos Peninsula, which forms part of the Zabaikalsky NationalPark. The sight is drawing us in. Svyatoy Nos Peninsula – Losing the Drone? From the village of Ust Barguzin runs a 20-kilometer sandbank to the peninsula. We have to pay a fee to enter, 100 roubles per person per 24 hours. We opt for two days. I am driving, initially on hard but smooth sand that deteriorates as we approach the peninsula. The sand path cuts through the forest with on the left side short tracks leading to the lake’s shore. We check one place out where we stand on the narrow beach for a while. The place is wild, mesmerizing, but the wind is blowing our way full force, the waves topped white and breaking hard. This is not a good place to camp today (we will the next day). Back on the main trail Coen takes out the drone. The forest gives a false sense of calm winds. As soon as the drone is in the air it flies off, the wrong way! It can’t fly against the wind, on the contrary, the wind is swiping it backward, eighty meters away from us, a black dot high in the air. We both run after it and fortunately retrieve it and – unsurprisingly – carry on without filming. The towering mountains are right ahead of it, calling out to us. 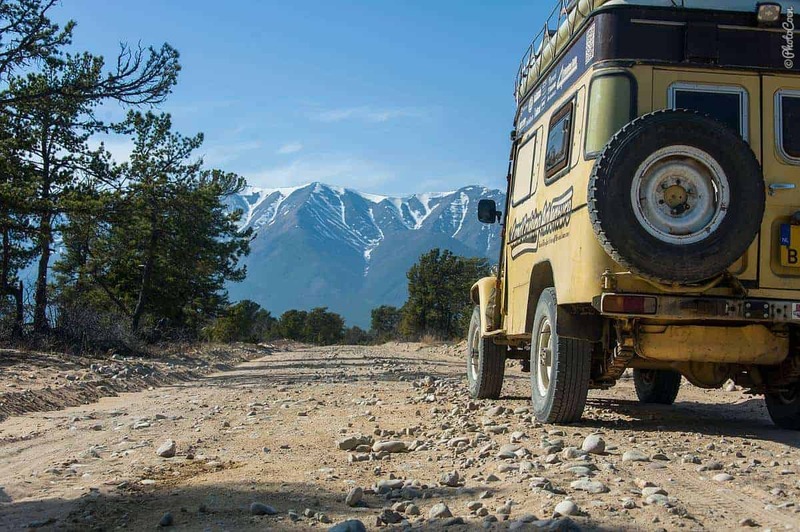 It’s a fabulous drive no matter the washboard that alternates with shifting sand in which the Land Cruiser lurches sideways. Finally we are right below the mountain. It is steep and covered with pine trees. At the entrance of a wooden staircase up a slope is a sign warning us for ticks, snacks and bears. The entire bay around us is covered with drifting ice. It crashes and squeaks and, in the late afternoon, turns bright red (the following morning, under a cloudy sky, it takes a much more transparent color). We’re camped just below the mountain wall to protect us from the wind. 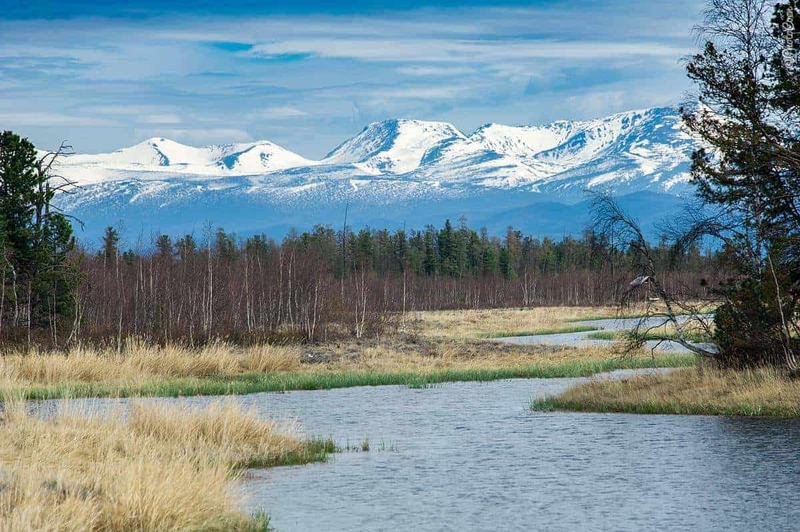 The horizon is lined with mountains, their tops still covered in snow. Early evening, the thinnest of a sliver of moon rises against the dark-blue evening sky long before it’s totally dark. It’s one of these places we are, once more, aware what a freedom we have because we travel by car. 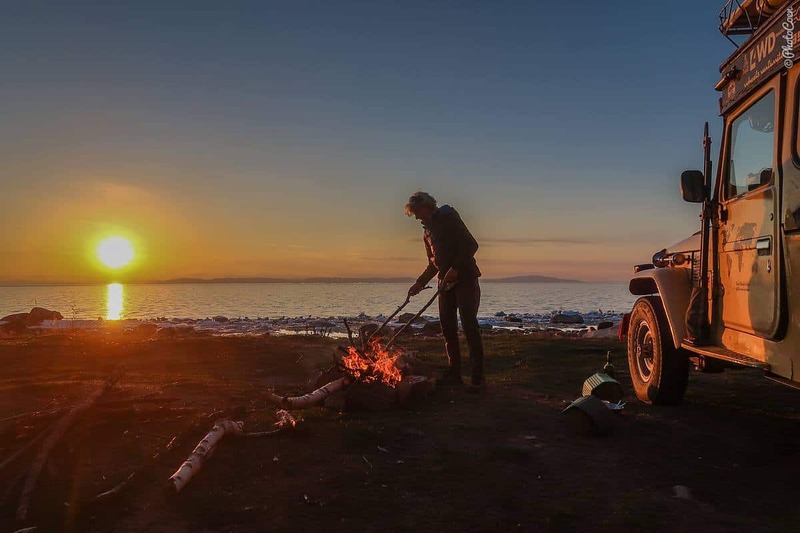 To be able to drive to such a remote corner in the already middle-of-nowhere wilderness in Siberia and set up camp, lit a fire, and watch the sun set behind the mountains in all solitude and silence. What a privilege to be here! For more movies, subscribe to our YouTube Channel and to get early access to all movies, join us on Patreon. As little $1 per month helps us to maintain this website. Thanks. I was thinking about you two just yesterday. As The Beast is getting closer I have been reviewing packing, looking at my map and trying to find information about travel in Peru. Looking to go to Chuchapallas in a couple of months. I know it is only six or seven hours south of the border but some of the things I’ve read; “The climb is only 10 km but because it is so steep and curvy it takes about an hour.” Apparently the scenery is beautiful. So I think about all you two have seen. We were fortunate to meet you. Lenny y Ana Maria Ledoux. We hope our roads will cross once more! Happy travels! I’m impressed! So beautiful! I didn’t realise this! 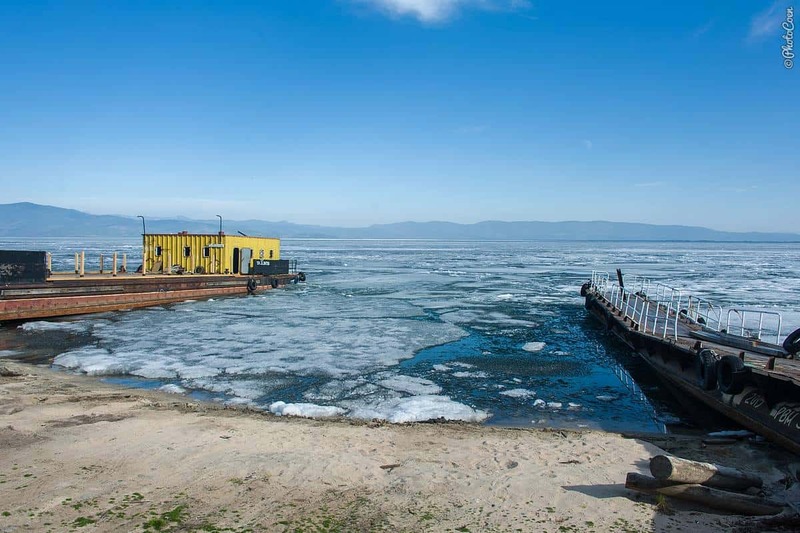 It’s my husbands dream to travel to the Baikal lake for his 50th birthday. Seeing this and Reading the blog, I’m even more convinced of going. So, go! 🙂 And have a great trip!